Brand: Commercial Dehydrator Systems, Inc.
Set of 14 SS Perforated Trays 24" x 38"
Set of 14 SS Solid Trays 24" x 38"
The Harvest Saver is an ideal machine for taking that first step into commercial dehydration. 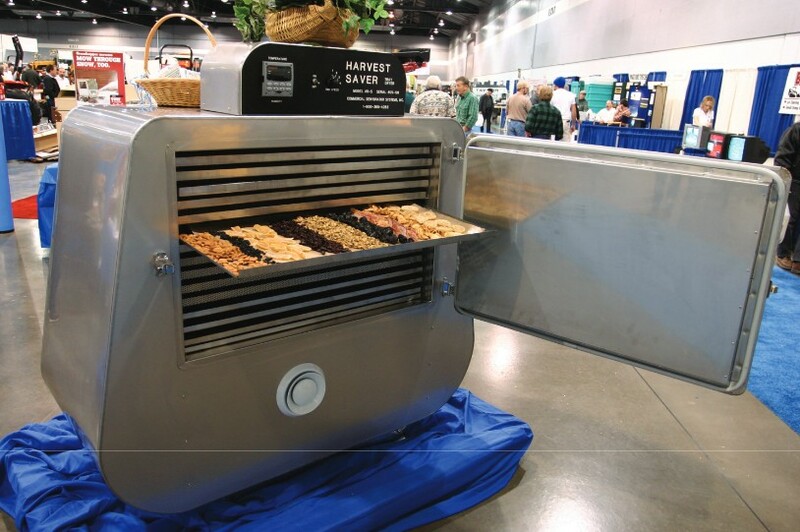 The Harvest Saver is a compact dryer, and one of our most popular. The Harvest Saver has the ability to dry a wide variety of products like jerky, wild flowers, fruit, health bars, and the list keeps growing! This kind of versatility, makes the Harvest Saver a great fit for most applications and an excellent choice for pilot projects, lab research, and food innovation centers. Full load amperes @ 46.5 using 4200 watts. Load amperes @ 3 to 40 amps depending on speed of fan and how full the dryer is with product. Wire gauge recommendation. Min of 6 AWG. 50 amps dedicated line recommended. In the Northwest this will help retain the heat and bring your cost to approximately $.45 per hour. It has 88 sq. ft. of drying space with 14 trays that are 27" by 38". It has 4 fan speeds. (1) 1460 CFM (2) 1675 CFM (3) 1865 CFM (4) 2200 CFM. We typically leave it on high unless we are blowing product off of the rack then we adjust it accordingly. 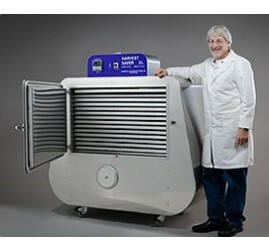 Needs to be vented outside similar to a dryer in your home. This unit has a variable intake system to control the humidity level. 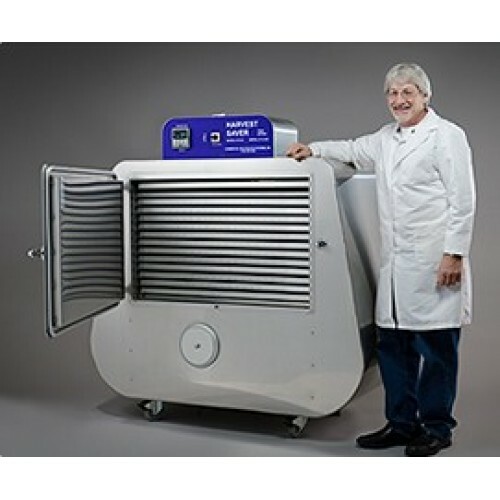 It is on wheels for ease of moving the unit and it is only 5' wide, 5' tall and 3' deep, so that it will fit through common doorways. Programmable up to 99 hours. It will go from ambient room temperature to 200°F/93.33°C. Unit is approximately 600 lbs alone; 800 lbs crated and shipped. Note: The Harvest Saver uses 220 volt, single phase power. All heating loads were computed based on a 40% consumption rate. This is an average figure, and may not accurately represent all applications. Energy costs will vary per Kilowatt. Please check utility rates or your area.